As new movie Stan & Ollie hits cinemas, we look at the iconic duo’s influence. WHILE YOU MAY recognise Laurel and Hardy as the forefathers of comedy, you won’t necessarily know the offstage and offscreen lives of Stan and Ollie – the two men who became the world’s first famous double act. The fame was well earned – the pair released 107 films between 1921 and 1951. And a new film, Stan & Ollie, looks to cast the light backstage on the lives of Englishman Stan Laurel and American Oliver Hardy. Together, they not only brought the concept of comedy duos to the screen, but also popularised the genre of slapstick comedy. Starring Steve Coogan and John C Reilly (who’s already picked up a Golden Globe nomination for it), the film follows a little-known final chapter in the pair’s lives, beginning in 1952 as they embark on a tour of the UK. So, why did Laurel and Hardy make such an undeniable mark on the face of comedy? Here’s why the pair changed the genre forever. Stan and Ollie weren’t just great for inspiring a laugh in our own homes. According to The Independent, Peter Sellers took a poster-sized autographed photo of Laurel with him everywhere. Ricky Gervais said “everything I’ve done I’ve stolen from them”, explaining to Black Sky Radio how they influenced characters for The Office, Extras and Derek. Mark Hamill is a huge Laurel and Hardy buff, while comedian Frank Skinner said that he used to subject girlfriends to the “Laurel and Hardy test” – showing them Way Out West to test their potential compatibility as a couple. The pair are so culturally iconic that you might have even missed them on one of the world’s most famous album covers – The Beatles’ 1967 album Sgt. Pepper’s Lonely Hearts Club Band (they’re both in the second row). Paul McCartney also gave Hardy a shoutout in the lyrics of Junior’s Farm. Although it first began in the vaudeville era of the late 19th century, the genre took off in the age of silent film. Soon, it was a combination of Charlie Chaplin, Buster Keaton and Laurel and Hardy who brought slapstick to the silver screen. That’s all according to TIME, who credit the pair for inspiring the likes of Looney Tunes and I Love Lucy. They were so important in the genre that during Slapstick Festival in 2018 (Bristol’s Silent Comedy Festival), comedian Lee Mack did an entire Stan & Ollie set, while the festival screened a newly restored, thought-to-be-lost Laurel and Hardy film – Battle of the Century (1927). In 1933, Stan Laurel and Oliver Hardy made The Sons of the Desert – a film so important that the likes of Vulture were still talking about it up until 2017 and TV Guide once called it the third “Best Show of All Time”. The film follows the pair heading to a convention hosted by a fraternity. When Ollie’s wife objects, he hatches a plan to sneak off. The storyline ended up being echoed in shows such as The Flintstones, All In The Family and King of Queens, which in turn inspired the likes of The Simpsons, South Park and Family guy – all of which feature a comical, rotund main character. When The Simpsons reached its 500th episode, Dan Castellaneta (who voices Homer Simpson), told The Hollywood Reporter how his trademark catchphrase ‘D’oh’, was inspired by a longtime supporting character in their sketches, who would utter the sound whenever he was hit in the head or fell victim to the duo’s antics. The pair are referenced in not one but five episodes according to Simpsons Wiki. In one episode, Stan Laurel and Oliver Hardy are seen in prison uniforms waiting to be relieved of their chains, while another features the pair getting off a train in a flashback of Abe Simpson’s. Watch the trailer for Stan & Ollie below. 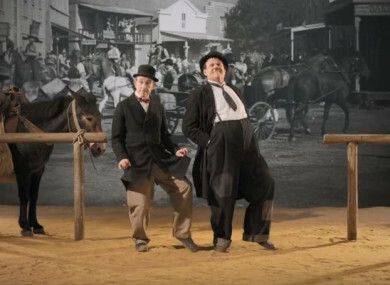 Want to see the untold story of the forefathers of comedy, Laurel and Hardy for yourself? You’re in luck – Stan & Ollie hits Irish cinemas on Friday, January 11. Email “5 ways that Laurel and Hardy shaped the comedy on our screens today”. Feedback on “5 ways that Laurel and Hardy shaped the comedy on our screens today”.